When this card on the field is destroyed and sent to the Graveyard: You can target 1 "Black Rose Dragon" or 1 Plant-Type monster in your Graveyard; Special Summon that target. This card's name and effect are based on its artwork. 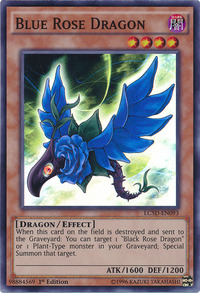 This monster is the first alternate form of Black Rose Dragon; it appears to be a younger version of Black Rose Dragon, akin to how Debris Dragon is to Stardust Dragon. This card is similar to Blue Flame Swordsman which can summon Flame Swordsman from the Graveyard. This monster's ATK, DEF, and Level (when rounded down to the nearest whole) are two-thirds that of Black Rose Dragon's". If the "Black Rose Dragon" was not properly Synchro Summoned initially, you will not be able to Special Summon it with the effect of "Blue Rose Dragon".